I can’t believe we just hit episode 10 of the Microsoft Cloud Show! It feels like a mini milestone. Episode 10 is jam packed with news and updates from the Amazon re:Invent conference, as well as news on the newly released Google Compute Engine & , of course, lots of Azure goodies too. Go get it and let AC and I assault your ear buds. Thanks for the amazing support so far with the podcast. We had > 7000 downloads over the past month or so which is astounding! This entry was posted in Azure, Cloud, MicrosoftCloudShow, Office 365, Podcast on December 9, 2013 by Chris Johnson. The only place to stay up to date on everything going on in the Microsoft cloud world including Azure and Office 365. Quite some time ago I bugged pestered asked my good friend Andrew Connell (AC) if he would be interested in starting a SharePoint podcast. Given he is a busy guy with a lot on his plate he wasn’t so sure it was a good idea to begin with. After all, we both said that if we were going to embark on something like this that we wanted to do it right. We ultimately decided to broaden the shows scope to include not only SharePoint … but rather take on talking about the whole Microsoft cloud story. After all, Microsoft are one of the largest Enterprise players in the market and there is A LOT going on in their cloud offerings. The Microsoft Cloud Show was born. Our aim with the show is to bring you news, information and commentary about all things going on in the Microsoft cloud world. We want to invite the listener into the show via way of audio and email questions sent in. We want to keep a consistent delivery of shows that you can count on. Most of all we want it to be easily digestible and will try to stick to 30mins per show. We are not pretending to be professional podcasters here and we will likely learn a lot along the way. But we hope you will join us for the journey. We are launching the podcast in iTunes (MS marketplace coming soon) with 3 episodes. These are just introductory shows and talk about our motivations for the show & then a background show on each host. We will be getting into the meat and potatoes in Episode 4 which is coming soon. Ideally we would love to settle into a fortnightly show. We would love to hear your feedback! We would love to hear about topics that interest you and that you would like to hear us address on the show. 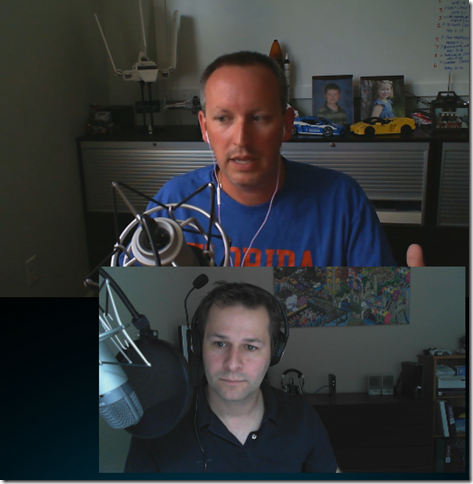 In the meantime … please enjoy this screenshot from us recording our first show. This entry was posted in Azure, Cloud, MicrosoftCloudShow, Office 365 on October 24, 2013 by Chris Johnson. I learnt something today that I thought would be interesting to share in the hope someone else won’t need to do the research. Say you already have Windows Intune or Azure AD already up and running and now you are ready to give Office 365 a go. 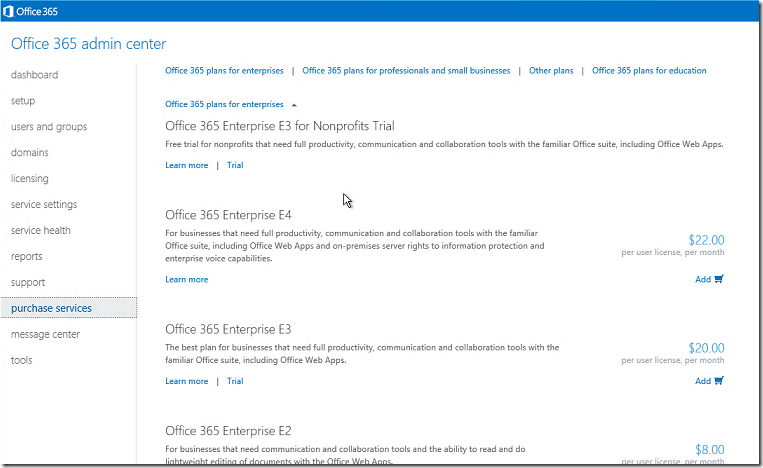 Extend your existing Azure AD tenant and add Office 365 services. 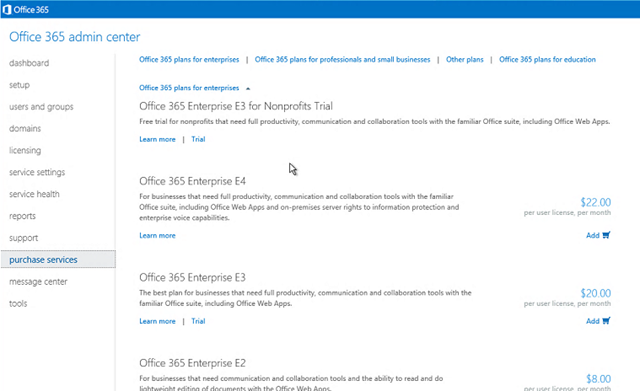 The correct way to do things is to Extend your existing tenant and add Office 365 services. 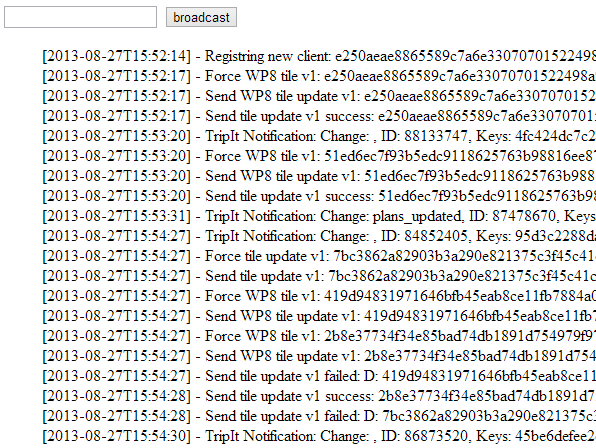 If you have Azure AD already you are likely DirSync to push all your user accounts from your on-prem AD to Azure AD. 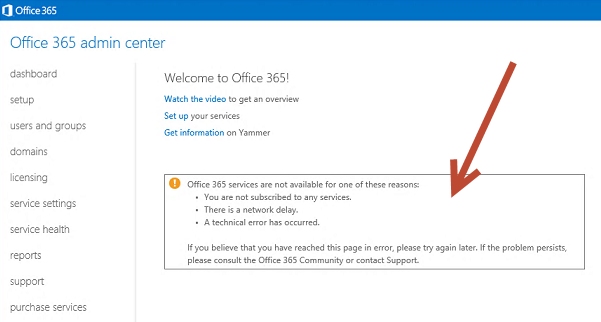 It makes sense that those are the same users you want to access Office 365 no doubt. If you try and create a new tenant and then do DirSync to that tenant you will most likely hit issues with trying to push the same users to two different Azure AD tenants. Extending is the way to go. 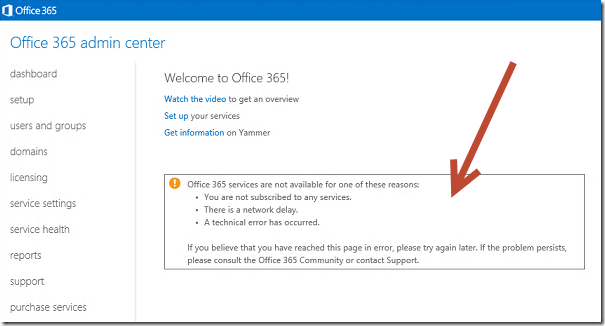 You will notice it is saying that you are not currently subscribed to any Office 365 services. So how do you go about adding those? Jump over to the “purchase services” tab in the left navigation and you will get a selection of the various plans (aka SKUs) available. In my case I picked the E3 –Trial. It seems blatantly obvious now I have tried this and this is possibly hardly worth a blog post, but until now I had always started from the Office 365 side of things and had never looked at starting with Azure AD and adding Office 365. This entry was posted in Azure, Cloud, Office 365 on September 11, 2013 by Chris Johnson. One of the tips I gave to during my session at TechEd North America this year was about using SignalR in your SharePoint provided hosted applications in Azure. One of the pain points for developers and people creating provider hosted apps is monitoring them when they are running in the cloud. This might be just to see what is happening in them, or it might be to assist with debugging an issue or bug. 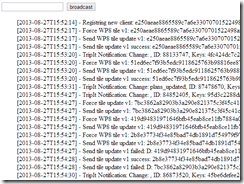 So how do I use it in SharePoint provider hosted apps in Azure to help me monitor and debug? A SharePoint Provider Hosted App is essentially a web site that provides parts of your app that surface in SharePoint through App Parts or App Pages etc… It’s a set of pages that can contain code behind them as any regular site does. It’s THAT code that runs that I typically want to monitor while its running in the Azure (or anywhere for that matter). So how does this work with SignalR? 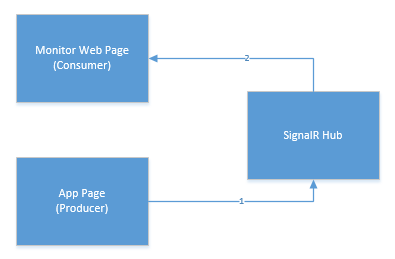 SignalR has the concept of Hubs that clients “subscribe” to and producers of messages “Publish” to. In the diagram below App Pages code publish or produce messages (such as “there was a problem doing XYZ”) and consumers listen to a Hub and receive messages when they are published. How do you get this working? It’s pretty easy. 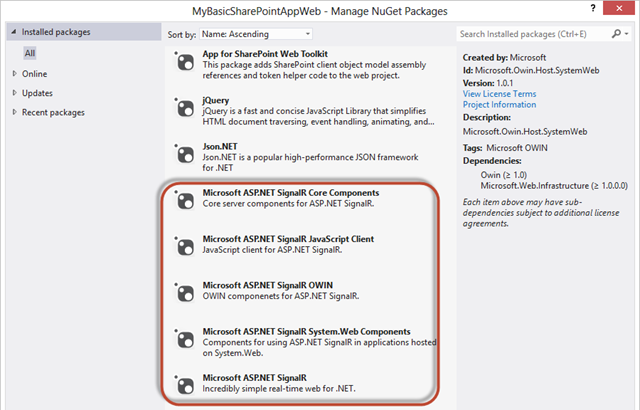 First add SignalR to your SharePoint Provider Hosted app project from Nuget. Click the image below for a bigger version showing the libraries to add. Then in your Global.asax.cs you need to add a Application_OnStart like this. It registers SignalR and maps the hub urls correctly. Note: You might not have a Global.asax file in which case you will need to add one to your project. That is all there is to publishing/sending a simple message to your Hub. This code uses the connection.hub.start() function to start listening to messages from Hub. When a message is sent the addMessage function is fired and we can do whatever we like with it. In this case it simply adds it to an element on the page. If you are sitting there thinking “What if I am not listening for messages? What happens to them?” I hear you say! Well, unless someone is listening for the messages they go away. They are not stored. This is a real-time monitoring solution. Think of it as a window into listening what’s going on in your SharePoint Provider Hosted app. There are client libraries for .Net, JS, iOS, Android too. So you can publish and listen for messages on all sorts of platforms. Another application i have used this on is for simple real time communication between Web Roles in Azure and Web Sites in Azure. 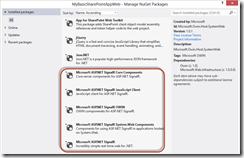 SignalR can use the Azure Service Bus to assist with this and its pretty simple to set up. I’m an developer from way back when debugging meant printf. Call me ancient but I like being able to see what is going on in my code in real time. It just gives me a level of confidence that things are working the way they should. SignalR coupled with SharePoint Provided Hosted Apps in Azure are a great combination. It doesn’t provide a solution for long term application logging, but it does provide a great little realtime windows into your app that I personally love. If you want to learn more about SignalR then I suggest you take a look at http://www.asp.net/signalr where you will find documentation and videos on other uses for SignalR. It’s very cool. This entry was posted in Azure, Development, Office 365, SharePoint on August 27, 2013 by Chris Johnson. This was a really cool session that focused on building out SharePoint farms in Azure. One of the things they talked about was a set of PowerShell scripts that they have built to fully automate this process. I watched the session in the online recordings after the TechEd and it interested me enough to try it out. So I did! and I have to say it totally rocks! The PowerShell all runs on your client machine and uses the Azure PowerShell Cmdlets to remotely setup Azure etc… Getting your machine setup before you run the scripts is a little tricky as it uses CredSSP for delegation which requires some manual setup, but if you follow the Wiki word for word you should be fine (here). My CredSSP setup failed because the Windows Remote Management service wasn’t running. 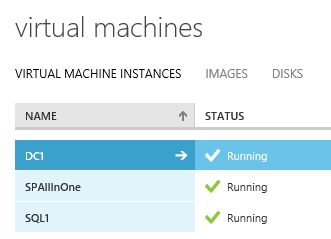 After you run the scripts you end up with a fully configured SP Farm running in Azure. Nice! I opted for the SingleVMs option … so 3x VMs in total. If you are looking for a quick and easy way to get started with building a SharePoint environment out on Azure then this is a great way to get started. The next thing I wanted to do was to connect my personal machine into the same virtual network that the VMs run on. 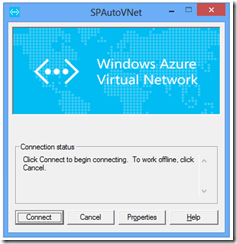 Azure provides the ability to set up a point-to-site VPN that lets you do this. 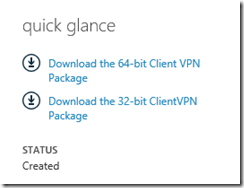 Once you have configured this you will end up with a VPN connection from your machine into the network with your VMs in Azure. This makes working with the whole setup a bunch easier and you can use your local machine for development and connect to the farm seamlessly. You could even join your machine to the AD Domain that was automatically created for you if you wanted. I did this & although its pretty complex it was pretty neat to finally get up and running. HOWEVER! One of the steps in that guide is creating a Gateway. This is the VPN endpoint that your client PC connects to. However, the steps in that guide assume you are creating a new virtual network whereas in my case the virtual network was already created. This means the settings referred to in the guide above are not available! 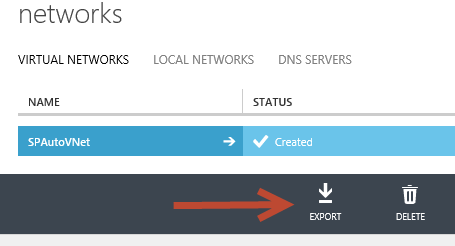 In particular i couldn’t modify the “Configure point-to-site connectivity” checkbox as it was disabled. This took me quite some time to figure out. This adds a gateway subnet and an address pool for client PCs that connect via VPN. Then you can reimport that configuration and your setup will be updated to include those settings. When you do that it can take a while to create the gateway … so be patient 🙂 it took about 10mins for me. 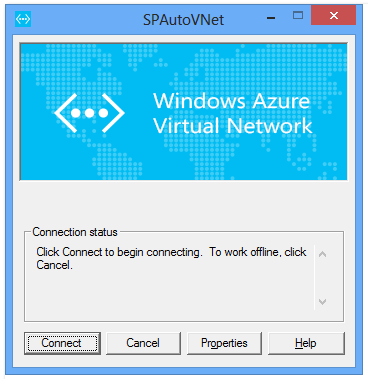 All going well you will be VPN’d into your Azure network and you should be able to ping the VMs! e.g. 10.20.1.5 is the main SP VM. I went and created a new Web App in SharePoint on http://intranet, and the only other thing I did was add “intranet” to my hosts file on the client PC so it knew to hit 10.20.1.5 (the SP machine). After that … boomtown! 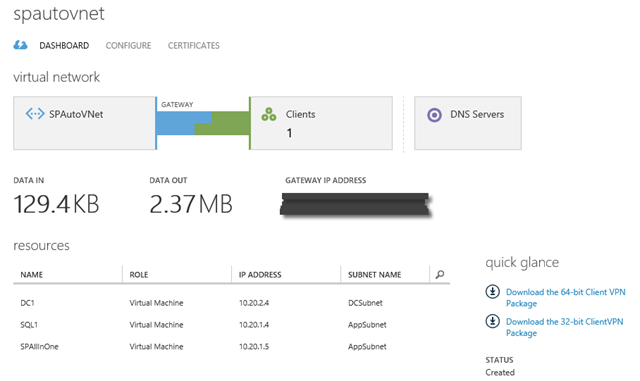 … my newly minted SharePoint site is available off my client PC via the VPN to Azure. This is going to be very handy for playing around with various SharePoint farm setups in Azure with the flexibility of having them run in the cloud. I don’t have a 32GB RAM laptop to do this “on prem” unfortunately. Azure VMs have only recently become affordable for me with the recent announcement that you don’t pay for them when they are switched off. This entry was posted in Azure, Cloud, SharePoint on June 14, 2013 by Chris Johnson.